Did a discrete event 200,000–100,000 years ago produce modern humans? Scenarios for modern human origins are often predicated on the assumption that modern humans arose 200,000–100,000 years ago in Africa. This assumption implies that something ‘special’ happened at this point in time in Africa, such as the speciation that produced Homo sapiens, a severe bottleneck in human population size, or a combination of the two. Schematic illustration of how the same coalescence time could be produced with or without a bottleneck. The thick lines show changes in human population size going back in time. 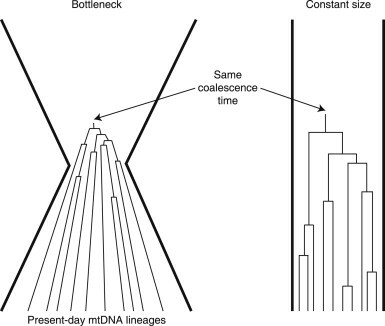 The thin lines show the coalescence of present-day human mtDNA lineages. Modified from Weaver and Roseman (2008). The common thread is that after the divergence of the modern human and Neandertal evolutionary lineages ∼400,000 years ago, there was another discrete event near in time to the Middle–Late Pleistocene boundary that produced modern humans. Alternatively, modern human origins could have been a lengthy process that lasted from the divergence of the modern human and Neandertal evolutionary lineages to the expansion of modern humans out of Africa, and nothing out of the ordinary happened 200,000–100,000 years ago in Africa. Three pieces of biological (fossil morphology and DNA sequences) evidence are typically cited in support of discrete event models. First, living human mitochondrial DNA haplotypes coalesce ∼200,000 years ago. Second, fossil specimens that are usually classified as ‘anatomically modern’ seem to appear shortly afterward in the African fossil record. Third, it is argued that these anatomically modern fossils are morphologically quite different from the fossils that preceded them. Here I use theory from population and quantitative genetics to show that lengthy process models are also consistent with current biological evidence. That this class of models is a viable option has implications for how modern human origins is conceptualized. Morphological distances between the present-day and past human means for any given trait under the specific lengthy process model considered here (see text for details). The distances are given in units of phenotypic standard deviations. The solid line gives the expected distance and the dashed lines encompass a 95% confidence interval for the distance for any particular trait. 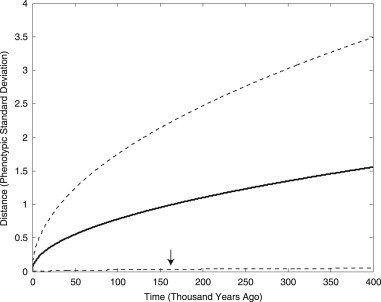 The arrow along the x-axis indicates when the past mean is expected to be within one standard deviation of the present-day mean (about 165,000 years ago).